“Todo el Peru lleva consigo una tradición que yace en los museos y otra que canta y baila en los pueblos. La primera esta allí catalogada, descontextualizada, la otra esta siempre en constante movimientos,” said Alan Poma last month in a speech at the Museo Experimental El Eco in Mexico City. All of Peru carries with it one tradition that is laid out in the museums, and another that sings and dances in the towns. The first lies there catalogued, decontextualized; the other is always in constant movement. Poma was in Mexico as the artist-in-residence at El Eco, where he produced a modernized, Americanized interpretation of the futurist Russian opera Победа над Cолнцем (Victory Over the Sun), first performed in 1913. Composed by Mikhail Matyushin, the original opera features a libretto in the invented language of Zaum written by Aleksei Kruchonykh. It tells the story of the defeat of the sun, which is also the defeat of decadence, and modernity’s defeat of itself. 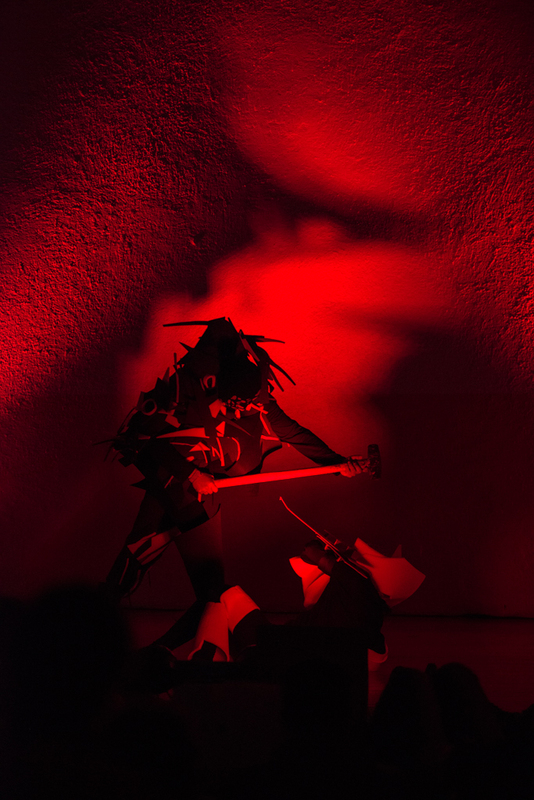 In Poma’s new interpretation, this narrative involves electronic sounds and projected footage of cosmic scenes; also prehispanic narratives and costumes made out of foam. The irony of Poma’s piece is that it was performed in a museum, that it has the potential to lie catalogued and decontextualized. The contribution he makes is to resuscitate the museum. Act One: It should come as no surprise that watching La victoria sobre el Sol was not always a comfortable experience. I watched the performance from the floor, which was itself a problem: the audience was told to lie down only after the space had been filled to capacity, so that moving involved a contortionist’s twisting around the bodies of other people. The opera began with unwanted intimacy. Watching the scenes flicker by, I found myself fixated on the musicians I couldn’t see, on the source of the sounds that I could not place. It was terrible not to know whether these noises were produced by humans, or humans wielding machines, or digital technologies. I couldn’t forgive the uncertainty of the music’s origins. The effect of NASA’s research, Poma said, is to “convertir una realidad invisible en visible para nosotros” (convert an invisible reality into the visible for us). “Esta labor que en algún tiempo caracterizaba a la practica artistica, ahora es generada por millonarias maquinas” (This labor, which at one time characterized artistic practice, is now generated by millions of machines). Act One made me think about the desire to separate the organic from the artificial, the authentic from the unnatural. Rockets and skyscapes earned equal rights in the opera, as if there were no difference between the cosmos we create and the cosmos that we know to exist. (We see the cosmos through the lens of our own imagination, of course). In the discomfort of not-knowing, Poma’s piece reminded me that the visible is actually invisible, and that artistic practice acts in the spaces we cannot perceive. Act Two: Poma’s mother tells me that first he wanted to be a doctor, but one day he came home from college and announced that he didn’t like medical students. So he decided to become a lawyer, but one day he came home from college and announced that he didn’t like law students. Then he became a rock musician; he doesn’t do that anymore, he says, because he grew tired of people hating him. There is plenty to hate about experimental performance art: it borders on pretention, on an excess of sincerity that stems from abstraction. (“Yace en los museos,” we might say; it is laid out in museums.) 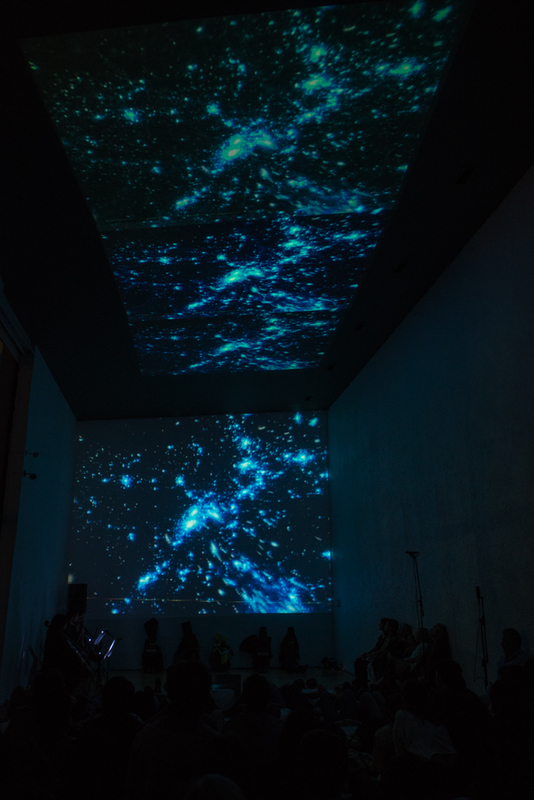 In the second act of Victoria sobre el Sol, Poma’s piece breaks from this abstraction: the sun, which has been projected on the walls, is made manifest in a dancer whose singing is beautiful and who in the end, as we might expect, is destroyed. There is so much relief in the straight, reliable beauty of the music in this second act; in the predictability of its narrative. But it was the humor that for me brought this piece to life. The costumes of the dancers, which were black and made of foam, were reminiscent of prehispanic gods. They were also reminiscent of Hugo Ball’s famous cardboard costume; the one that he wore, as Poma puts it, “proclamando darle una bofetada al buen gusto de la burguesia” (Declaring the intention to give the good taste of the bourgeoisie a slap in the face). I can’t speak to Poma’s intentions, but my experience of this performance placed a great deal more faith in humanity. The concluding number, a guitar solo improvised by the Traveller in Time, was playful, and pleasurable, and left me laughing. Alan Poma is a musician based in Lima, Peru. If you’re interested in learning more about Poma’s work, the website for La victoria sobre el Sol is a remnant of the original whole, with music, art, and photographs. Are you a UT graduate student, professor, or alum? Pterodáctilo is soliciting reviews in English or Spanish of new art, fiction, poetry, and scholarship relating to Latin America. Contact halperta@gmail.com for more information.